The Spanish Steps have been an inspiration for poets, painters and artists since the early 1720s. They’re also a landmark I frequented during my fourth visit to Rome in June. My Italy Perfect apartment was just a one-minute walk from Piazza di Spagna, the home of the Spanish Steps. The 138 Roman Baroque-style steps are iconic for their elegant and unique butterfly design, connecting the Piazza di Spagna with the higher piazza Trinita dei Monti. 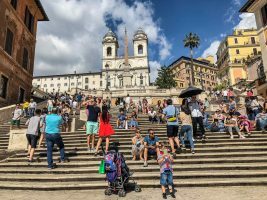 Once a popular meeting place for creatives, the Spanish Steps is now a gathering place for Romans and travelers of all backgrounds. It felt fitting to call this area, more specifically the Sabini Sistina Apartment, my home base for my most recent visit to the Eternal City. 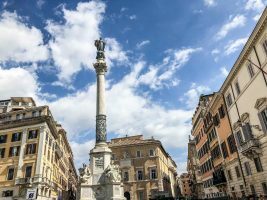 Staying near the Spanish Steps, and coincidentally near many of Rome’s most famous attractions, was my best option for such a brief visit to the capital city. However, I was greeted by far more than just a desirable neighborhood when I arrived at the Sabini Sistina apartment. Natural lighting, cozy but modern furniture, and a traditional Italian terrace provided the European elegance I love without the touristic hotel feel. Experience Rome’s traffic, and you may think a relaxing haven on one of Rome’s most historic streets is impossible to find. But the peaceful Sabini Sistina apartment overlooking the constant motion of Via Capo le Case, is just that. 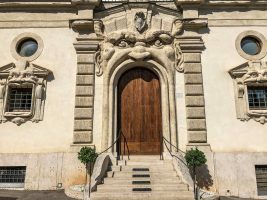 Simply stepping out of the apartment and into the neighborhood means discovering art galleries, people watching at the Scalina Spagna and exploring the former home of John Keats. 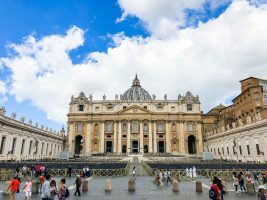 So many of Rome’s top attractions are just a short walk from the Sabini Sistina apartment leaving the hassle of battling that infamous Rome traffic out of the picture. I was able to walk to Italian architect Nicola Salvi’s Trevi Fountain in five minutes, and ancient Rome’s best-preserved building, the Pantheon, in 13 minutes. Exploring these areas by foot also meant discovering the local shops like those on via Frattina, cafes, piazzas, and galleries sprinkled in between. Note to shoppers: it only took a few minutes for me to drop my shopping bags back at the apartment before venturing to farther attractions. The nearby location of the subway station at the Spanish Steps, just a 5-minute walk away, became a great convenience. Less than 20 minutes on the subway, and I was at the Vatican Museums and St. Peters Basilica. 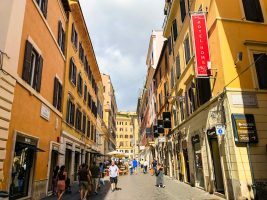 There’s never enough time in Rome for me, but staying near the Spanish Steps at the Sabini Sistina apartment made squeezing in all of the sightseeing, shopping and dining that much more convenient and enjoyable.